The way we get around is changing fast. Between ride services, on-demand car sharing and other methods to have a car only when you need it, owning one is getting less and less compelling. A new startup called Carma offers a happy medium for those who want the convenience of owning a car without the hassle of, well, owning a car. Instead, you just subscribe to it. Carma launched publicly today at the Startup Battlefield at TechCrunch Disrupt SF 2018. Its system is more flexible than a lease, cheaper than hourly or daily car-share services and precision-targeted at millennials (whatever those are) and dealerships. It works like this: You pick from a variety of new and newish vehicles sourced from the inventory of car dealerships in the area. For a set monthly fee you basically get to treat it like your car. Insurance is included, as is ordinary maintenance — you’re mainly on the hook for gas and a few incidentals. Keep paying for as many months as you like, or just one, and when you don’t need the car any more, just give it back to the dealer. Boom, you’re car-free again. The assumption is that there’s a considerable population of people who are caught between the high-cost, low-commitment world of car and ride sharing and the variable-cost, high-commitment world of ownership. They don’t want to have a $20,000 asset sitting around doing nothing but costing money, but they also don’t want to pay through the nose every time they want to go more than a mile or two. Where’s the medium-cost, medium-commitment option? That’s where Carma intends to fit in. Ultimately the cost is more per month than a lease or ownership, but if what the driver values is flexibility, there’s no comparison. More importantly, it’s a great option for dealerships. These places have all kinds of inventory sitting around that could be deployed in whatever manner they see fit: a couple for extended test drives of new models, a few older ones paying their way despite being the last four on the lot from last year, a different way to monetize overnumerous used vehicles, and so on. It’s not the only one — Fair and FlexDrive are startups with similar aspirations and are already on the market. And some car manufacturers offer specific, though often luxury-oriented, medium-term subscriptions. Carma, however, is taking a slightly different tack. 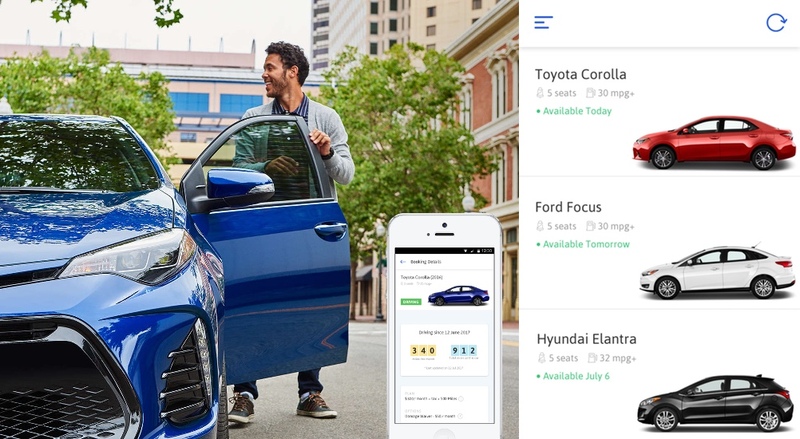 While those services are direct to consumers, Carma aims to be a white-label backend for similar services branded and operated by local dealerships and finance outfits. Carma tested the consumer model but found there was friction from usurping the place of primacy for drivers from the dealers themselves. After all, your local Subaru dealer doesn’t just want to be a lot filled with cars — they want to be a known, local presence and trusted maintenance partner to their customers. So the deal would be that Carma provides all the infrastructure as far as handling insurance, fleet tracking, user agreements and billing, but it all takes place through an app specific to a dealer or group of them. It allows that direct connection between driver and dealer to stay in place while offering the benefits of subscription to both parties. Dealers would pay a monthly license fee based on the size of the fleet. Organizations that manage leases could also be the client, providing the subscription possibility to multiple dealers they work with. This is the case in one of Carma’s early deployments in Canada, where a leasing outfit with more than a billion dollars (Canadian, naturally) in lease originations has launched its own branded subscription service, AutoONE. Allowing the dealers to keep their pride may be a serious advantage over national or international branded services that treat them like inventory management modules. And the mobility market is large enough, of course, that several services should be able to compete alongside one another with variations in offerings and inventory. After all, why pay for a service with built-in insurance if your job pays for it? Alternatively, why have your own if you can get it month by month for a few bucks more? Want to switch your car every month? Want to pay less to be limited to models three years old and back? These variations will certainly all be put into play. Reda comes from a computer science and fleet management background at the University of Michigan, where of course some of the sharpest minds in automotive tech can be found. The company is a Techstars alum and is backed by them, Fontinalis, Kybba, Right Side Capital, and IDV — terms undisclosed for now. The mobility space is evolving fast, and it’s companies like these that keep that evolution rolling along.